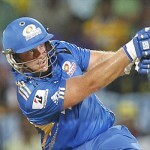 Mumbai Indians triumphed in one of the low scoring games by five wickets at their home ground on Sunday, April 29, 2012 at Wankhede Stadium. The wicket was a bowler’s paradise and did not qualify for the stroke play which is the beauty of the shortest version of the game. The crowd love to witness the bowlers being butchered by the batsmen at their will and the high scores are always heartening for the public present in the parks and the viewers glued to the TV sets all around the globe. Deccan Chargers batsmen found themselves in deep trouble once they were sent into bat and the best partnership of 37 runs in 5.3 overs was contributed by their openers, Parthiv Patel and Shikhar Dhawan. The latter was the highest scorer in the innings with 29 off 32 balls with 3 fours, followed by Jean-Paul-Duminy who remained unbeaten for 25from 24 deliveries assisted by 3 fours as well. Seven of their batsmen could not enter in the double figures which reflected the state of the poor batting strip. Lasith Malinga enjoyed bowling at the track and clinched four wickets for just 16 runs in 3.4 overs and Harbhajan also achieved his best bowling figures of the tournament by taking 2-13. Mumbai Indians batsmen also struggled as well except Rohit Sharma who was the top scorer with 42 from 48 balls which comprised one six and 4 fours. The most experienced batsman, Sachin Tendulkar, could manage just 14 runs off even balls. Ambati Rayudu was at the crease with a fighting score of 19 off 15 balls with 2 fours as the home side achieved the target by scoring 101 runs after losing five wickets. Dale Steyn grasped the best bowling figures of 2-10 in four overs and was honoured with the ‘Player of the match’ award. “Naach Na Aave aangan Tehra”. Bhaji pitch remains the same for both team so why you complaining. Just play better dude. You should not complain with the pitch but focus on winning matches.